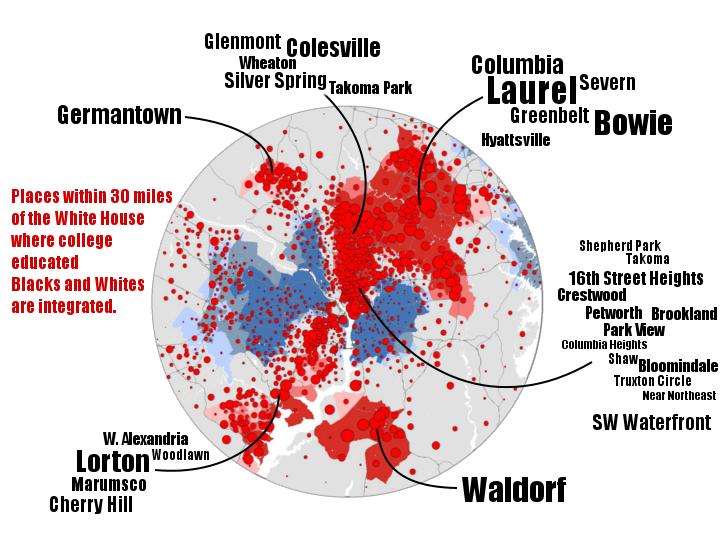 Last week in the Washington City Paper, I stated the obvious: DC's neighborhoods are segregated by race. Several readers countered that the root problem is that the city is segregated by class, and this manifests itself as a racial division since DC's rich tend to be White and the poor tend to be Black. That theory is true to an extent, but it misses a lot. 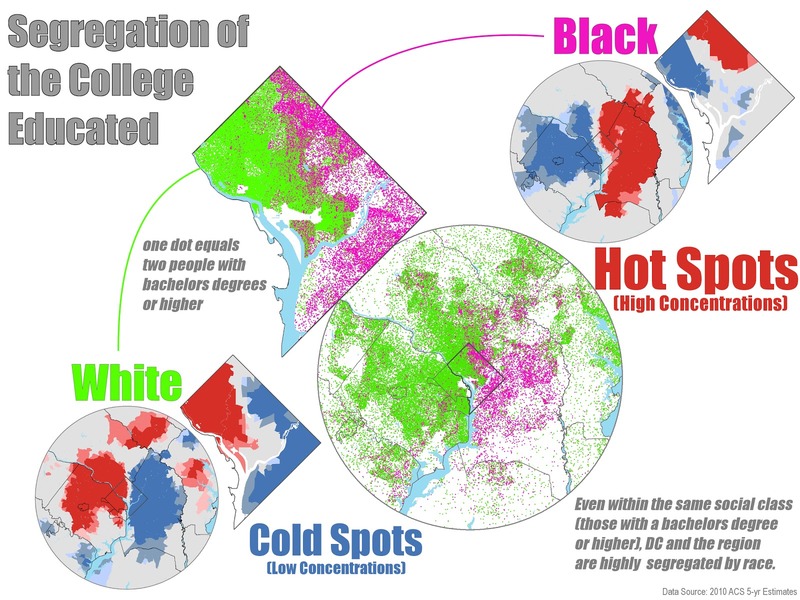 Even within the highly educated social class (people over the age of 25 with a bachelors degree or higher), DC and the region appear to be extremely segregated. Educated Blacks are concentrated in Prince George's County, DC's Ward 4, and southeastern Montgomery County. Educated Whites are clustered in the western half of DC, southwestern Montgomery County, and Fairfax County. Mathematically, there is no reason that these clusters can't occupy the same space. In a racially integrated but socially segregated environment, you would find highly educated whites and blacks in the same census tracts. Clearly this is not the norm in the DMV. This map uses an invented indicator, equal to the number of college grads of the minority race (white or black) divided by the number of college grads of the majority race, multiplied by the number of total college grads, white or black. The closer a neighborhood is to having a 1 to 1 ratio of educated whites to educated blacks, the higher the score. And the more highly educated folks the neighborhood has overall, the higher the score. So an area with a high score on this indicator will be both highly educated and diverse. Chances are, few clusters in the country can boast such a diverse population of highly educated residents as the places listed here, so we've got that going for us. But there's too much blue. DC's (and America's) segregation problem is social, economic, and racial, all at the same time. And as a number of commenters noted, the real question is what can we do about it?